Please read *all* previous comments before posting. Mainline kernels are known to not experience this bug, although in general are not supported (i.e., using one is a workaround, but if they break other things you're generally out of luck). Additional "me-too" comments aren't useful, feel free to select the "This bug affects me too" option and/or subscribe to this bug instead. I'm using 8.10 Kubuntu with all updates done on system. System is a clean installed system with EXT4 formating and using 2.6.8-8 linux kernel. System sometimes lock and freeze whole inputs even keyboard or mouse. so i have killed X and kdm. i tryto apt-get update to make system under CPU load. and after a while it happens again. No Keyboard response no harddisc response total freeze. I'm sure that it isn't. Because df shows me there are more than 7 Gb freespace. Not always getting this error. like saying disk is full. I think it is releated to Ext4. But i'm not sure these 2 bugs releated or not. I have exactly the same problem with 2.6.28-8.26. The problem started to appear only recently (2-4 days ago). The problem manifests only when deleting files - it never triggers when adding files. The problem occurs regardless of X running. 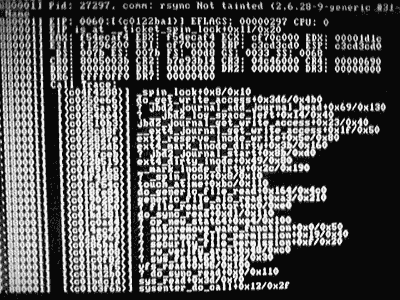 Interesting is that the problem occurs on 32bit kernel only - 64bit 2.6.28-8.26 does not seem to be affected. I've encountered it more than 7 times (today 3 times). First time it happend while moving my /home (4GB) to /mnt/Data, I had to reset the computer and lost some data (not very important thankfully). Today I've tried to clean the pbuilder enviroment with "ARCH=amd64 DIST=jaunty sudo pbuilder --clean" and after restarting my .kde directory was gone. It seems the freeze occurs when moving or deleting big portions of data. Anyone else can confirm it? I had experienced the same, and reported it at https://bugs.launchpad.net/ubuntu/+bug/334581. I have had to hard reset my computer four times today. The circumstances were the same all 4 times: I was copying large directories between different ext4 partitions (using nautilus) when the system locked up. The directories in question have tens of thousands of small sized files. I am going to mark bug 334581 as a duplicate of this one so that we can focus our discussion and testing on one bug report. Alarming frequency of kernel freezes when working with directories that have lots of tiny files: see https://bugs.launchpad.net/ubuntu/+source/subversion/+bug/342164. That bug reporter's system froze, was hard reset, ext4 had not written the newest file to disk. Question: what is causing all these freezes? I have experienced something similar to the first poster: I installed ubuntu 9.04 alpha 5 last week on a newly formated ext4 partition. As I was setting the system up, I was updating the system with the latest package updates but I kept running into an error saying the drive was full (it was actually at 20% full of 160 GB). Tried moving and deleting files off the drive, nothing worked. Eventually a reboot solved this but I don't know why. Upgraded to kernel 2.26.28-9 (alpha 6) on Friday. This weekend I went about converting 2 x 1 TB data drives to ext4 (from ext3) and all went initially well but I wanted to get the full extent (no pun intended) of ext4 file structure so I was cut and pasting data back and forth between the drives using nautilus but the OS kept freezing. Eventually I figured out that copying and pasting was fine but deleting was the culprit. I tried deleting in nautilus and that hung the OS. Tried in a terminal, same thing. Booting into recovery mode and down to the root prompt and went about deleting these files and got a series of these: "BUG: soft locking - CPU#0 stuck for 61s!" In the end I managed to completely clear one drive off so I reformatted it and then transferred everything back and then reformatted the other. Now both TB drives have "native" ext4 partitions and I can delete from those drives without hangs or freezes. From Agent N20's comments above, it appears that the freezing occurs where ext3 partitions were converted to ext4 partitions. I have 3 converted ext4 partitions and one fresh/new one. Will try and test that theory a little tonight. To the other reporters: were your ext4 partitions new or converted? The reporter of bug 340628 provided a stack trace. Forgot to mention that the freezing didn't happen ALL the time with the ext4 deletes. When I was cutting and pasting it would get a few mins in and freeze, and elsewise I was able to delete some files but others made it freeze. I suspect it may have been LARGE files but I do not have solid proof of that. > solid proof of that. currently using with Jaunty due to this issue. It looks like the converted vs native ext4 filesystem info I gave earlier was a RED HERRING! I just got another system freeze deleting files off my EXT4 partition that I had reformatted (using mkfs.ext4) yesterday. I have just dropped down to a root shell on the recovery mode to see if I can figure out which specific file (size?, type?) causes problems. Well, I could not reproduce the latest system freeze. Certainly the frequency of the system freezing from EXT4 deletes is much, much lower on this new native EXT4 partition as opposed to the converted version. I am going to do some more spring cleaning to see if it will freeze up again. In all 3 cases it froze immediately after I said yes to the "are you sure prompt" and also I was able to carry out the exact same delete after the reboot, without issue. The freezes I initially reported occurred when I was moving large folders between ext4 partitions (moves between partitions involve deletes). When I am doing this kind of re-organizing, I usually have several move operations going on concurrently. Could it be that the bug is triggered more easily when there are multiple delete/move operations going on concurrently? Last night I moved 70GB of data between 2 ext4 partitions. All the 70 GB was moved in one sequential operation. The computer did not freeze. I dropped one one of the ext4 partitions, re-created it, then moved the data back. The machine still did not freeze. This evening I will "manufacture" some data that I can afford to lose then move it helter skelter between several ext4 partitions, making sure that there is a large number of moves active at any particular time. just had another freeze. I was deleting a virtual machine snapshot (relatively large file). when I rebooted, I was able to finish deleting. Confirm that similar regular freezing occurs only on my machine, with ext4 FS converted from ext3. Typically the freeze occurs under high disk activity; I believe when the freeze has happened, I have had a rsync job traversing whole /home, which contains a large number of small files. It might be of note that the system did not initially respond to SysRq commands at first, but responded only after a few minutes. These freezes occur very frequently, typically within a few hours of uptime. This bug severely affects viability of using ext4 partitions (if the problem really has to do with ext4). Probably unrelated information: freezes occur both with the non-free Nvidia driver and the free Xorg nv driver. Message is something like "BUG: soft locking - CPU#0 stuck for 61s!" I should add that my file system is new and not a convert from ext3. Whole system lockup is the end result and need a hard reset. or doing the keyboard combination, would probably be helpful for getting to the bottom of what appears to be a deadlock. Vanilla kernel 2.6.29-rc8 works well for me. So either this problem was fixed in kernel 2.6.29-rc8, or the problem is caused by Ubuntu kernel patches. Reproducing this bug to get a trace corrupted my system so badly not even a ubuntu jaunty CD will boot without locking the system hard. I'm now stuck on my laptop since I have no way to rescue! I'm not sure this patch will fix the problem (since I haven't been able to reproduce it yet), but it is at least plausible that this reported "brown paper bag" bug might be responsible for this failure mode. The patch which I've attached fixes a real bug, and it will be headed to the stable kernel series as soon as it gets accepted upstream, and I'd strongly encourage Ubuntu to pick up this patch. Whether this patch fixes the rm -rf --> soft lockup problem is a different story. (09:27:06 PM) SuperSquirrel: I am using ubuntu stock kernel on jaunty now and hasnt frozen since i turned app armor off. Can anyone else confirm that if they disable apparmor, the problem goes away? Hello I am "SuperSquirrel" on the IRC. I have compiled a 2.6.29 Kernel last night and my system has not hung yet. I have also tested the stock kernel in ubuntu jaunty alpha with app armor deleted and my system has not hung up yet. So i think the problem lies with apparmor somewhere as some ext4 developer said on IRC yesterday. Simply unloading Apparmor service doesn't help. Is there a quick way to disable apparmor in the kernel too? It seems to be something that was fixed in 2.6.29. >Vanilla kernel 2.6.29-rc8 works well for me. So either this problem was fixed in kernel >2.6.29-rc8, or the problem is caused by Ubuntu kernel patches. The first patch, which I suspect is more likely the fix, was merged into 2.6.28.8 and 2.6.28-rc6. The second patch was merged into 2.6.28-rc8, and isn't yet in a 2.6.28.y series yet, although it is in the for_stable branch of the ext4 git tree. >Vague guess but does this bug have any relevance? I don't think so. The date on that is January 2008, and that patch was integrated long ago. >It seems to be something that was fixed in 2.6.29. Apparmor seems less likely to be the cause, as does any of Ubuntu's "sauce" patches. I have a report from someone who is using a completely stock kernel who has seen this bug on 2.6.28, 2.6.28.4, and 2.6.29-rc6 (which if confirmed rules out my "most likely fix" in comment #27 above). Since apparmor isn't in a stock mainstream kernel, it now looks like the problem may have been fixed sometime between 2.6.28-rc6 and 2.6.28-rc8. Thanks to all who have been helping to work this bug! the kernel versions you would like us to test is 2.6.29-rc6 and 2.6.29-rc8? There have been numerous references to 2.6.28-rc kernels as well above which has got me all confused. Yes, that's correct; if you could test 2.6.29-rc6 and 2.6.29-rc8, I would be much obliged. Sorry for the other references to other -rc kernels. I'm gathering information from other sources, including updates from this Launchpad comment stream, and each time I can get more information about "I can reproduce the problem on kernel <foo>" and "The problem seems to go away on kernel version <bar>", we get more information. The object here is to find out which patch actually solves the problem, so I can make a recommendation to the Ubuntu kernel devs to backport that individual patch --- since at this late date it is highly unlikely they will suddenly move Ubuntu Jaunty to use the just-released 2.6.29 kernel. My usual test, which involved deleteing 40gig of video files, that reliably crashed 2.6.28 hasn't crashed 2.6.29-rc6 yet. Since I may have just gotten lucky I'll do some more testing tommorrow. If I can't get rc6 to crash is there much point in testing rc8? Update: After doing even more testing this morning, I'm 99% sure 2.6.29-rc6 isn't affected by this bug. Hi, I could not reproduce the bug in 2.6.29-rc6 or 2.6.29 final from the same source (http://kernel.ubuntu.com/~kernel-ppa/mainline/). But I can reproduce it in 2.6.28.9 as well as in the latest ubuntu kernel. Hmm. So two people have said they haven't been able to reproduce the bug in 2.6.29-rc6. Unfortunately, one poster on the linux-ext4 claims that he experienced the problem (including getting his file system corrupted) while running that version, 2.6.29-rc6. I'll have to ask him to confirm this. Also, all of the most likely bug fixes in 2.6.29-rc6 were forward ported to 2.6.28.8 (and thus would have been in 2.6.28.9). So we have some contradictory data out there. I'm not sure how to reconcile these reports. Can those folks who say they aren't seeing a problem with 2.6.29-rc6 try with 2.6.29-rc4 and 2.6.29-rc5, to see if they can trigger the problem there? I haven't tried with rc5 but I can't trigger the lockup in rc3 or rc4 at all (after much trying too!). Going back to ubuntu 2.6.28 I can still trigger it almost immediately. http://kernel.ubuntu.com/~kernel-ppa/mainline/ doesn't have any more built kernels lower than rc3 so I'm stuck unless someone can point me to a tutorial on compiling rc1 from source. I am now compiling rc2. Will tell the result in a few hours. Again, this is mostly useful so we can tell the Ubuntu kernel devs which patch to backport for the official Ubunut Jaunty kernel. (Fedora 11 is going to be using 2.6.29, so they won't see this issue.) So unless someone can help me reproduce it on my test system (which is a 1Gig netbook with a 5400 rpm drive running Ubuntu 8.10 with an updated kernel), I really will need someone who can reproduce it and who knows how to drive git and do kernel builds out of a git source tree to localize this down. on the same workload, but doesn't hardlock consistently. I Didn't know about the python script; I'll try it after work. I just read through all the comments (I hope), and did not find this mentioned, so I thought it might be helpful.. I had the problem for a long time, but didn't bother too much. Now it got annoying and after some searching I installed mainline 2.6.30 to see if it would work. After logging in I found I had 10GB more space on my Home-Partition (the Trash only had ~1GB in it) The partition is only 40 GB total, so that's a lot. I checked if something was missing, but didn't find anything, which was strange. On closer inspection these were all files I supposedly deleted a long time ago, when the freeze appeared afterwards. I have no idea how they got there, I'm just a user...but maybe that info can point someone into the right direction. > mentioned, so I thought it might be helpful..
> I had the problem for a long time, but didn't bother too much. Now it got annoying and after some searching I installed mainline 2.6.30 to see if it would work. > After logging in I found I had 10GB more space on my Home-Partition (the Trash only had ~1GB in it) The partition is only 40 GB total, so that's a lot. I checked if something was missing, but didn't find anything, which was strange. > On closer inspection these were all files I supposedly deleted a long time ago, when the freeze appeared afterwards. I have no idea how they got there, I'm just a user...but maybe that info can point someone into the right direction. I'm sure that this is just one of the many ways to trigger this ext4 thing, still, interested me even if not the cause of the bug. Found this thread which seems to be same issue. Appears that this is related to permission/ownership - so presumably you deleted read-only files. I can imagine that might happen if, for example, the files were copied off a CD and had default read-only permissions. I'm suprised nautilus doesn't handle this more gracefully. I highly doubt that it had something to do with permissions, as there were really all kinds of files (audio, video, documents..) from different sources (downloads, self-made..). I didn't mean this to be a cause of the bug, but rather a result and maybe an indicator to where things might be going wrong. Didn't crash with 10GB of 100GB. Yep, crashed on round 3.
for the freeze to happen. This is on a AMD Athlon 64 Processor 3700+. suggests that we are really running into a timing/race problem here. It happened very frequently on my Dual Core i86 based system (never got more than 5 single rm commands off without a hang before I went to the higher kernel) so it certanly can happen on multi-core systems often. Your theory on race conditions is interesting though--it certainly exhibits the behavior of a race that goes infinite and does not get caught. about different processors, I'll contribute some fluffy info. experienced any more "freezes" temporary, or otherwise. > higher kernel) so it certanly can happen on multi-core systems often. > experienced any more "freezes" temporary, or otherwise. apparently solved and NOBODY decided to just backport the damn patches from the more recent kernels... I mean, its been MONTHS, and I'm not running Linux to have random crashes. For me, I installed Kubuntu Jaunty fresh with native ext4 and external backup drive, also ext4. Actually it was because of a system crash in which I lost my complete partition. So I want to have the backup-system working now before I proceed! But I was stuck because of this ext4-bug, system freezed very often! I'm just a user and didn't want to experiment!! Ext4 is not the default fs on ubuntu I read above, ok but I really regret that I chose this during graphical installation! Sorry that I didn't read the full release notes, I had no idea that it is that experimental! But this doesn't put it in GRUB, so you have to change your menu.lst and do update-grub and update-initramfs. Well, no crashes so far, even copying about 30gig. I actually removed the "nodelalloc" mount option, still stable so far. I really recommend to get a newer kernel ( >=.29), especially because this is just an Ubuntu problem and Ted Ts'o is probably busy fixing more important stuff :) But the ubuntu guys should provide indeed an automatic update for the _really_ unexperienced people! I've also been using the Karmic kernels on Jaunty (and the new nvidia drivers) as suggested by martinm1000. Unfortunately, it seems to require also updating the graphics drivers, in my case nvidia. I've applied this temporary fix a while back, seeing this is taking too long to fix. I also vote for a backport as a temporary fix, instead of having inexperienced users jump through hoops. Most of the solutions posted so far seem to mess with your 3d acceleration, either requiring an update to the video drivers or manual installation. Another reason why i think a backport would be preferred. I understand package policy would make it difficult for kernel 2.6.29 or newer to make it into jaunty. But isn't that what "jaunty-backports" is for? Using mainline kernels or getting karmic packages is not exactly a 1 click installation, and in fact could break your system. A backport on the other hand can be enabled using the GUI. And could provide an easier fix for those who need it. 4) Use apt or synaptic to get the packages you want. > also updating the graphics drivers, in my case nvidia. for 2.6.29 and it worked, I have 3D. > fix for those who need it. 'proposed' or 'backport', your system maybe not stable anymore!". Updating the kernel fixed this for me. Thanks JoseStefan for easy instructions. I think one of the hardest parts of trouble shooting this is that it only seems to happen on certain hardware configurations, which means that initially I thought it was a hardware glitch of some kind due to it not happening on any other computers with almost the same software setup. This sounds similar to a problem that I experienced yesterday. I did a fresh installation of Ubuntu 9.04 recently and formatted every partition to ext4. Yesterday, I was moving huge video files from my home directory to a removable USB hard disk (formatted to ext4 as well) when the system froze permanently (i.e. all hard disks stopped running completely). I did this with a couple of my other removable USB hard disks and the same thing happened many times. The problem can be replicated by copying or moving files within the same IDE hard disk as well. Just a while ago, the system froze when I emptied Trash. The computer has Windows XP installed, and no such problem problem occurs when I'm running it. However, as far as I know, I have not experienced any data loss. With reference to a few of the comments made above, I have more than 40Gb on every partition at any time, so the locking up seems unrelated to the amount of free hard disk space that one has. I've installed the kernel in Jaunty proposed some days ago and since then I haven't had any hang. My system seems much more stable now. I have the -14 kernel, and just hit this bug again last night (actually caused me to lose a fair amount of data). Are people still looking into this? By most accounts, the "fix committed" doesn't fix the problem. Which kernel version are you using exactly? Mine is 2.6.29-020629-generic, manually installed. But I would prefer to have a system with standard components. But I don't want to risk loosing my data again. Since the last updates, it worked better : I could suppress definitively files in Nautilus without crashing. But one time doing this I got a freeze, and 2 times also during copy / cut - paste of files (around 9 Gb), on a partition with a lot of space available for the first one. * SAUCE: Added quirk to enable the installer to recognize NetXen NIC. verification failed, but the patch doesn't appear to have introduced regressions, so the updated kernel has been published to jaunty-updates. Resetting for the next pass. I can reproduce this every single time when deleting large files from ext3 partitions as well as ext4. I have too noticed that it is easier to reproduce when the working partition is low on free space. In my case though when reviewing the log files each soft lockup instance has lines in common relating to 'eCryptfs'. My other kernels 2.6.29.6 and 2.6.30.5 do not have this problem. Im running a fully updated Jaunty and I am still experiencing lockups when deleting large files/directories. Any idea of when will have a fix release for jaunty? At this point, it seems pretty clear to me that no one is really working on this for Jaunty; if you must use Januty, the only thing I can suggest is to use a mainline kernel --- any mainline kernel, whether it is 2.6.28, 2.6.29, or 2.6.30 will work fine. The problem seems to be in Canonical's backports of patches to the 2.6.28 kernel, and the only people who could work on it are busy working on the Karmic release and/or the Karmic kernel. Those of us (like myself) who are working on the upstream ext4 are busy working on the latest set of improvements and bug fixes that will go into 2.6.31 or 2.6.32. For those of you who need some proprietary drivers, I'm sorry to say, the only thing you can really do is wait for them to become ported to the Karmic kernel (or port them yourself). Is there a list somewhere of notable patches / features which Canonical has integrated into their kernel? I'd like to switch to a mainline kernel to avoid this bug (which is still affecting me), but want to be sure I'm not missing anything critical which Canonical has changed. Should we close this bug for Jaunty as no one is working for it (see comment 256) ? No, Jaunty is still supported (it's still the latest release) and the bug is still confirmed, therefore closing it would be inappropriate. It would also don't help developers to track the bug and work on it later. mounting the ext4 filesystem with the mount options "sync,barrier=1" seems to solve the problem on my case (2.6.28-15-generic). thanks taigolp! I can confirm as well that mounting my native ext4 with "sync,barrier=1" option in my fstab solves the problem on Jaunty. actually I'm sorry, I take that back. I was trying to rm -rf over 1.3TB of data, composed of over 17,000 sub directories each a dozen or so files located inside. I too had complete system lock-up when I would try deleting them (moving and copying was fine). I tried to move the directories in blocks of about 100 or so to another directory, then tried deleting those. I had the same lockup issues. The method that taigolp proposed helped a lot, but didn't completely solve my problem. While I could delete about a 100 or so directories now, I still can't delete the entire 17k directory tree without a full lock-up. for the record, I'm running jaunty 32-bit, 2.6.28-15-generic. ext4 native on a LVM volume spanned across two 1.5TB sata drives on a silicon image SATA pci card. It seems to me that this is fixed in the patches committed from #418197. Can anyone else confirm? I was able to delete around 2.6 million links and files in a single rm -rf, which would previously cause a lockup in a minute or two. no "BUG: soft locking - CPU#0 stuck for 61s! [uic: 5356]"
mean 2 PC had the problem, 2PC solved !!! Previously I had to switch to mainline kernel (I chose 2.6.30.6). It seems like the fix has been released for this but I am still having this problem. I can copy large files (around 15-20 gig) to a NTFS hard drive and there is no problem. However when I try to copy same files to an internal hard drive which uses ext4, the system freezes. I am using Karmic with kernel 2.6.31-16-generic. My question is, how do I get the fix? I get auto updates but do I have to manually install the fix? And where is the patch files are located? "However when I try to copy same files to an internal hard drive which uses ext4, the system freezes." This would be a different bug, as this bug only occurs when removing files. "My question is, how do I get the fix?" It looks like the latest karmic kernel release is 2.6.31-17. You might want to try installing that. If that doesn't work, and assuming that it really is a kernel problem and not caused by something else, you could try the 2.6.32 kernel from lucid's repository, though since lucid is still in alpha stages, it might be best to find out if it really is being caused by the kernel first. I have experienced a similar bug removing largish video files (about 4GB or so) from an internal SATA drive formatted with an xfs filesystem. Sometimes when doing an "rm -rf" on a directory on that file system, the rm will hang and remain pegged at 100% cpu usage. As opposed to other posters in this thread, I don't see any suspicious messages in dmesg about hangs or timeouts, and usually I'm able to "rm -rf" the directory in question from another terminal session without a hang. The only thing that kills the rm is a reboot, kill -9, Ctrl-C and so on all won't work on that process. Please let me know if you need any further logs, I'm running kernel 2.6.32-27-generic #49-Ubuntu SMP Wed Dec 1 23:52:12 UTC 2010 i686 GNU/Linux on Linux Mint10 which is based on Maverick 10.10. Displaying first 40 and last 40 comments. View all 270 comments or add a comment.